With its track record of climate disruption and unabated emissions growth, 2018 might sow doubt about the viability of meaningful climate action. And yet, by following a trajectory from international cooperation to efforts at the national and subnational level, and even to the role of traditional indigenous practices, the articles in this issue collectively affirm both the importance and availability of climate solutions that transcend all geographic, political and cultural boundaries. In addition to articles on COP 24, indigenous knowledge in climate solutions, liability and responsibility, climate change and the Security Council and discontinuity and conflict in U.S. climate policy, this issue includes reports on legal developments in Europe and internationally. 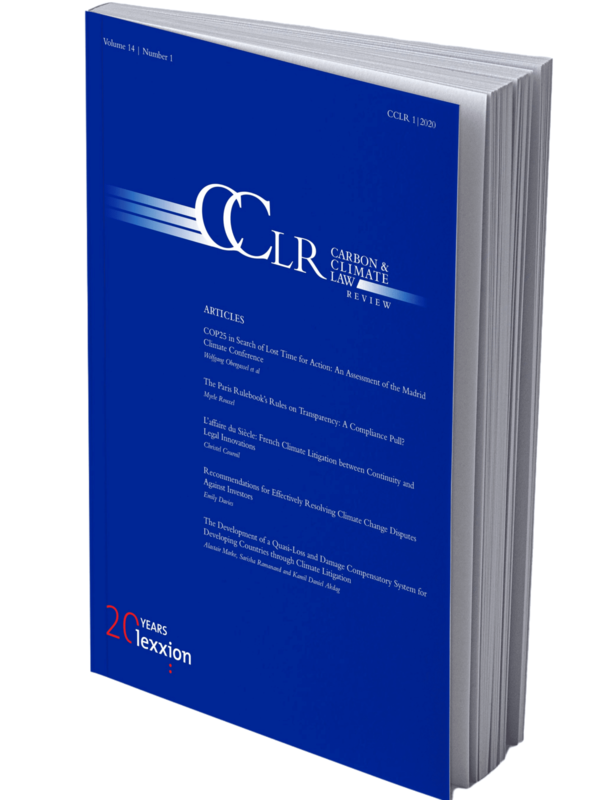 Published on a quarterly basis under the guidance of a distinguished editorial board, CCLR brings together representatives from the legal discipline and other stakeholders in one specialised journal, allowing them to engage in a dynamic debate on the law of climate change. Reducing Emissions from Deforestation & Degradation (REDD). CCLR is aimed at anyone with an interest in the legal aspects of climate change mitigation and adaptation. This includes, but is not limited to, areas such as emissions trading, regulatory and policy developments and international climate negotiations. As such, CCLR acts as a forum for practitioners, legal experts and academics working in the field. Ilan Gutherz, Van Ness Feldman, Washington, D.C.
William Burns, Johns Hopkins University, Washington, D.C.
Kyle W. Danish, Van Ness Feldman, Washington, D.C.
David Freestone, Sargasso Sea Alliance Washington, D.C.
Annie Petsonk, Environmental Defense, Washington, D.C. When the Intergovernmental Panel on Climate Change (IPCC) released its Special Report on Global Warming of 1.5°C this past October, it recited a familiar message, but expressed that message in the direst terms yet: climate change impacts are already being felt around the world, exacting a considerable toll on natural and human systems. If we are to avoid this outcome it is clear we need effective policies. Featuring articles on the political economy of carbon pricing, fiduciary duties incumbent on pension fund trustees, non-adversarial parametric Insurance schemes and agricultural policies in climate governance, this issue illustrates the challenges that politics pose to drawing up policies to meet challenges outlined in the IPCC report. View all articles of CCLR 4/2018 HERE. Between 3 – 14 December climate negotiators from around the world will once again meet at the annual Conference of Parties (COP). Taking place in Katowice, this year’s COP is expected to finalize the rules for implementation of the Paris Agreement on climate change under the Paris Agreement work programme (PAWP), otherwise known as the Paris Rulebook. With this in mind we have dedicated a Special Issue to exploring a variety of issues that make up the ‘Rulebook’, including further guidance for the contents and features of Parties’ five-yearly nationally determined contributions (NDCs), accounting rules, modalities for the Agreement’s review mechanisms (transparency framework, global stocktake and implementation and compliance mechanism), and rules for the operation of the new cooperative mechanisms established by the Agreement. With COP24 fast approaching, this special issue offers an excellent preparatory guide for those attending the conference or interested in its outcomes. View all articles of CCLR 3/18 HERE. Over the last two decades a multifaceted legal regime which governs, regulates and steers climate action has emerged. Featuring articles, amongst others, on international climate diplomacy, climate litigation, the implementation of REDD+ and the international carbon currency market, the latest issue of the Carbon & Climate Law Review is reflective of the scope of this regime. In addition to the six in depth articles, Issue 2/2018 also includes updates on developments in North and Latin America as well two book reviews. View all articles of the current issue CCLR 2/2018. CCLR 1/2018 is a Special Issue on the legal aspects of the hotly debated 1.5°C target. All countries recognise the existence of climate change, its anthropogenic nature and the need for international action on climate change mitigation. Nevertheless, the level of global ambition on climate change mitigation has been the object of a protracted debate. This issue offers six in depth Articles on these ambitions. Specific topics of discussion include, the risk of unintended consequences, carbon pricing and its potential as an instrument of deep decarbonisation in line with the 1.5°C target and national legal frameworks which seek to turn NDCs into reality. View all articles of the current issue CCLR 1/2018. The advertising prices are valid from January 2018. Please provide the advert in a PDF-X-1a format + 3 mm bleed (without crop marks). Become an Author for CCLR and view our Call for Papers. Spontaneous contributions are welcome and should be sent to the Editor-In-Chief Michael Mehling at mehling@lexxion.eu or the Executive Editor Jakob McKernan at mckernan@lexxion.eu. Only submissions of excellent quality will be accepted in CCLR. Responsibility of the factual accuracy of a paper rests entirely with the author. All publications must clearly distinguish themselves from the status quo of discussions – in particular through sufficiently broad publication footnoting and referencing – and provide an added value to those discussions. Contributions should not have been published, nor be pending publication elsewhere. Whereas opinions and case notes may be more factual and focussed, articles must rely on preexisting literature and jurisprudence, even if the positions expressed there are to be contradicted. Likewise, submissions relating to very recent developments require less footnoting and referencing than submissions relating to familiar topics. Publications not up to this quality standard will be rejected. After the manuscript is submitted, it will undergo a process of peer review for accuracy, quality and relevance. Submission of a manuscript does not imply claim for publication. Optionally before submitting a manuscript, the editors may be contacted regarding the suitability of a given topic for CCLR. Book Reviews should be between 1,000 – 3,000 words (including footnotes) in length. The review should provide details about the contribution and structure of the book, as well as assess critically the books arguments focusing on key philosophical or theoretical issues. Articles should be between 4,000 – 7,000 words (including footnotes) in length (MS Word Format, in British English). 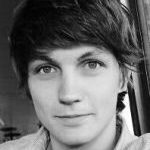 All contributions use footnotes, but not a list of references. Longer articles are accepted on a case-by-case basis if more space is required by the topic. Each article is preceded by a short abstract (without heading) of five to six sentences. Every word in the title should be capitalised except for conjunctions (Headline Capitalisation). The title’s length should not exceed three lines after typeset (max. 150 characters including spaces). Subtitles are allowed and should also not exceed the 3 lines rule (max. 200 characters including spaces). Authors’ details Author(s) details should be included in a first asterisk footnote (*) inserted after the author’s/authors name(s). Example: Article Title David Freestone*___* Prof David Freestone, Lobingier Visiting Professor of Comparative Law and Jurisprudence, George Washington University Law School. For correspondence: <dfreestone@law.gwu.edu> To do so: In the References ribbon tab, click the Footnotes launcher (lower right corner in the Footnotes section). There, place an asterisk into the Custom mark: box, then click Insert, and type your footnote text. All further footnotes should be numbered sequentially in superscript in the text outside punctuation marks. Tables and figures should be submitted on extra pages. Every table should have a title. The relevant sources of the data presented or of the tables or figures themselves should be indicated. Within the text, the position at which a table is to be included should be marked by ‘[TABLE …]’, the tables and figures being clearly numbered. Every table should be referred to. To ease the typesetting process, please keep formatting within tables to a minimum (eg avoid merged cells or the use of vertical text for headings).